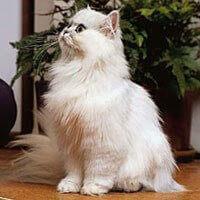 The luxurious Persian cats are still extremely popular and much sought after by many cat lovers. The Chinchilla is a stunning cat with a silvery coat while the original Persian cats came from Turkey and they wore a thick white coat. This warm and friendly cat is a large-sized animal with a square body sporting quite a round and flat face with small ears. It has luminous green eyes outlined in the same colour as its coat tipping. Its gorgeous coat is long and silky and is further highlighted by its bushy tail. The main overall colour is white with black tipping giving a sparkling appearance. One of the most famous Chinchilla cats was known as Silver Lambkin and it is believed he was the originator of this distinctive colouring and he went on to win many of the major awards at the Crystal Palace Show in London in 1888. This elegant cat hails from America and the UK and is more of an extrovert than most of the other Persian cats! They have melodious voices and are quick to adjust to any new environment in which they might be placed. Having a 'laid-back' temperament they make an ideal family pet for those who have time to brush and groom daily.